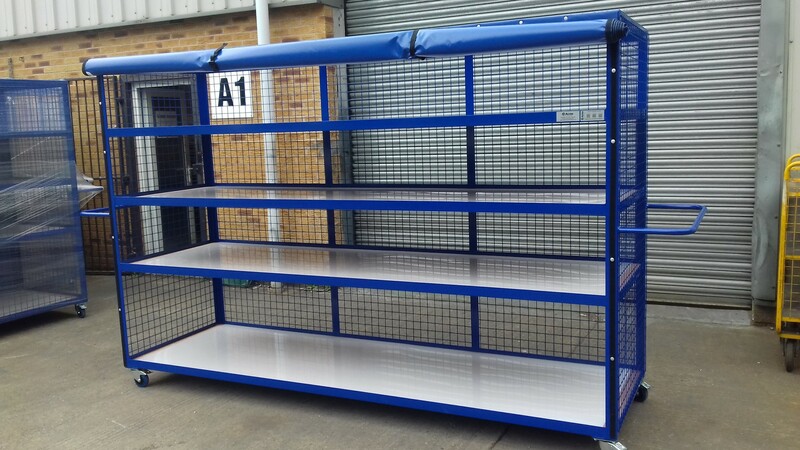 The Engine Strip Storage Trolley is a mobile racking solution has been designed and manufactured for a client operating a servicing and maintenance area within Heathrow for the aerospace industry. The engine strip storage trolley provides a storage solution which can be easily manoeuvred into different locations to suit requirements. The solution has been manufactured from 50mm angle for the main framework with 50mm flat support bars. The design features 4 off shelves are set at approx 400mm apart. Each shelf features an MDF wooden panel with a HDPE liner. The HDPE liner can be removed for cleaning, allowing the trolley to be maintained and kept in good condition. To the front of the solution is a blue PVC cover to protect parts. The solution has been assembled with high quality swivel with brake castors. The trolley is completed with a front cover spanning the width of the trolley and secured by straps and toggle latches. The solution has been powder coated in Dark Blue RAL 5002 to provide a hard wearing long lasting finish.